A Magical Weekend of Pet Adoptions and Unusual Holiday Fun! 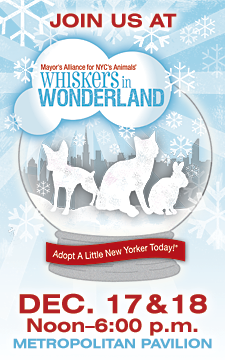 New York, NY – Friday, December 9, 2011 – Whiskers in Wonderland® is just around the corner, and the Mayor’s Alliance for NYC’s Animals® has announced exciting additions to the event’s program. This annual holiday pet adoption extravaganza takes place from 12:00 to 6:00 p.m. on Saturday, December 17, and Sunday, December 18, at the Metropolitan Pavilion, located at 125 West 18th Street in Manhattan. Participating adoption organizations include All About Spay Neuter, Animal Care & Control of NYC, Animal Haven, Animal Rescue Fund of the Hamptons (ARF), Anjellicle Cats Rescue, ASPCA, Bideawee, Bobbi and the Strays, Bronx Tails Cat Rescue, Care for Cats, City Critters, Empty Cages Collective, Eve’s Sanctuary, For Animals, Inc., KittyKind, Liberty Humane Society, Long Island Cat/Kitten Solution (LICKS) Rescue, Linda’s Feral Cat Assistance, New York City Feral Cat Initiative, Patricia H. Ladew Foundation, Picasso Veterinary Fund, Posh Pets Rescue, Rabbit Rescue & Rehab, Sean Casey Animal Rescue, Tavi & Friends, Urban Cat League, Washington Heights Cat Colony. What better way to celebrate the spirit of the season than to grant a homeless pet’s number-one wish — the gift of a forever home? In return, you’ll receive a gift of unconditional love that will last a lifetime! Since adopting a pet is a commitment for the life of the pet and involves the entire household, bring everyone along to meet your new furry family member. Come to Whiskers in Wonderland to adopt an adorable animal from any one of 26 participating shelters and rescue groups of the Mayor’s Alliance for NYC’s Animals. And while you’re there, enjoy a wide range of fun, free activities, including a special holiday pet fashion show hosted by certified pet fashion designer Ada Nieves. Dogs, cats, bunnies, a large rat, a lizard, and a fish will strut their stuff in a unique holiday fashion parade at 1:00 and 4:00 p.m. both days. 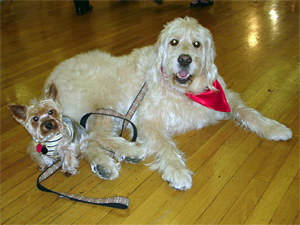 Bocker, the famous Labradoodle, will join the fashion parade on Saturday. Between shows on Saturday, Jilli Dog, the poker-playing Yorkshire Terrier whose fame as an actor has spread widely following an appearance on Animal Planet, will perform tricks with her stage dad, Rick Caran. Have you ever wondered what your pet is thinking? What’s behind some of those endearing or quirky behaviors? What special holiday gift does your pet really want this year? 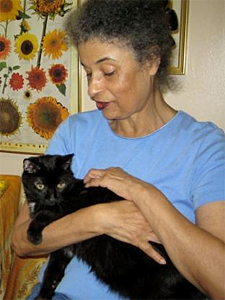 Pet psychic Catherine Ferguson will be on hand from 2:00 to 5:00 p.m. both days to help you answer these, and other, pressing questions. Pet caricaturist Lorelei will create whimsical portraits of pets and their people, so you can always remember that classic expression you love so much. In keeping with the spirit of the holidays, photographer Monique Toro of Kujo and Bear teams up with Maddie, the six-foot Miniature Schnauzer mascot from Maddie’s Fund® (decked out as Santa) for photos with kids, friendly pets, and other family members. Looking for special holiday gift ideas that will help New York City’s homeless animals? Stop by Alex and Ani’s Bangle Bar at Whiskers in Wonderland, where you can purchase a beautiful exclusive bangle that features the Mayor’s Alliance paw print logo charm or one of many other beautiful bangles, handcrafted in the USA using recycled metals. Check out the exclusive new Mayor’s Alliance t-shirt created by SocialPakt. And meet photographer Melissa McDaniel, who will offer copies of her three extraordinary photo books for sale, including Rescued in America, Deaf Dogs, and her latest, Pit Bulls. A portion of each bangle, book, and t-shirt sale will be donated to support Mayor’s Alliance lifesaving programs. And there’s more! On Saturday only, Dr. Cary Nulton will be available to answer questions about your pet’s health. Both days you can get advice from pet experts, and chances to win exciting prizes in the Whiskers in Wonderland Raffle. 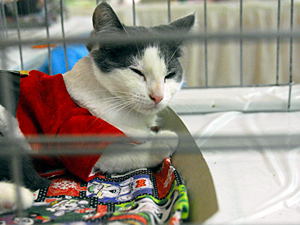 Whiskers in Wonderland is sponsored by Mayor’s Alliance longtime partner, The Cat Fanciers’ Association, along with Dr. Elsey’s Precious Cat Litters, and Royal Canin. Representatives from other prominent pet brands also will be on hand for advice and sampling, including Stella & Chewy’s pet treats and food and Sturdi Products pet carriers. Also meet the creator of Tails Untold Personalized Pet Books and discover this unique gift idea. Admission is free to the two-day event. Pet adoption fees are determined by each rescue organization. Event times are Noon–6:00 p.m. on Saturday, December 17, and Sunday, December 18. For more information about Whiskers in Wonderland, visit: www.WhiskersInWonderland.org. To find out about other upcoming adoption events this holiday season, visit: www.AnimalAllianceNYC.org/adoption. Bloggers are other supporters are encouraged to display an event banner on their blog or website — thanks!